Seventeen years after the Gulf war, a congressionally mandated committee has concluded that “Gulf war syndrome” is a legitimate condition that continues to affect one quarter of the nearly 700,000 US soldiers deployed in that war. In a report presented last month to the Secretary of Veterans Affairs, the Research Advisory Committee on Gulf War Veterans’ Illnesses said, “Scientific evidence leaves no question that Gulf War illness is a real condition with real causes and serious consequences for affected veterans.” We speak with a Gulf War vet who was a part of the committee and who himself is sick. Guest: Anthony Hardie, Member of Research Advisory Committee on Gulf War Veterans’ Illnesses and National Secretary and Legislative Chair of Veterans of Modern Warfare. The 450-page report details the serious longstanding and sometimes permanent neurotoxic damage seen in veterans of the 1991 war with Iraq. It concludes that the condition was primarily caused by overexposure to pesticides and a drug given to troops to protect against nerve gas. The US government has long denied the existence of Gulf War syndrome, despite growing evidence and claims by veterans. Gulf War veterans were often told they were suffering the effects of post-traumatic stress disorder, and their symptoms were trivialized. The report says that no effective treatment has been found so far and emphasizes the need for further research. AMY GOODMAN: Anthony Hardie is a veteran of the Gulf War, member of the Research Advisory Committee that authored the report. He is national secretary and legislative chair of Veterans of Modern Warfare and a former officer with the National Gulf War Resource Center, joining us from Madison, Wisconsin. Welcome to Democracy Now!, Anthony. You’re sick, as well? AMY GOODMAN: Can you tell us what you suffer from? ANTHONY HARDIE: Absolutely. I’ve had health issues ever since being in the Gulf. First, about two-thirds of the group that I was with began to be ill from the pyridostigmine bromide, or the nerve agent protective pills that we took, and then, once in Kuwait, began having severe respiratory and sinus issues. Those have continued and have progressed into the kinds of chronic multi-symptom illness that I’m certainly far from unique. 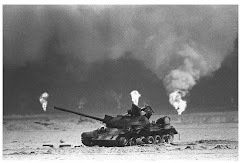 Between 175,000 and 210,000 of my fellow Gulf War veterans are suffering from the same kinds of symptoms and illness that I’m suffering from and many far worse than my situation. JUAN GONZALEZ: Well, could you tell us a little bit about what the report concluded, because obviously there’s been a lot of debate over the years about the many possible causes of what came to be called as Gulf War syndrome? ANTHONY HARDIE: Well, that’s right. Well, it was an exhaustive study of about—a survey of about 1,800 scientific studies. And I want to clarify, the report was written by the scientists on the committee, and there are five of us Gulf War veterans on the committee, and we assisted in reviewing the report, but it was a scientific report. And the study concluded that pyridostigmine bromide, or the nerve agent protective pills, and pesticides were the two, could be linked causally to the health effects of Gulf War veterans and a majority who are suffering from chronic multi-symptom illness. It also determined that we could not rule out a number of other potential causes, including low-level nerve agent and chemical warfare agent exposure throughout the Gulf War and a number of other causes. 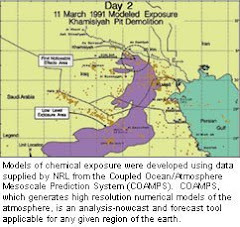 It suggested that things like depleted uranium, while there are known health effects including cancers, was probably not the cause of the chronic multi-symptom illness affecting most Gulf War veterans, but it certainly didn’t rule out that depleted uranium has health effects of its own. AMY GOODMAN: Were you surprised by any of the findings, Anthony Hardie? And talk about the significance of this being well over a dozen years since you were serving in the Gulf. ANTHONY HARDIE: Well, seventeen years after the war, the report says what we Gulf War veterans have been saying all along. And that’s that we have health issues, that those health issues began during the Gulf, that they have progressed since then, that they have been largely unabated and that they’re continuing. So the report says in scientific terms what we’ve been saying all along. The most disappointing thing is that current VA secretary, Dr. James Peake, said during his presentation that we neither deny nor trivialize the health issues of Gulf War veterans. Yet just a few days later, Secretary Peake and the federal VA referred the report, rather than jumping on its conclusions and making benefits and healthcare changes for Gulf War veterans, referred it to yet another committee, the Institute of Medicine, deciding that they needed further evidence. And it’s awfully disappointing that still, seventeen years after the war, nearly 200,000 Gulf War veterans still remain ill and are not getting adequate healthcare from the federal VA. And as I testified before Congress last year, being seen is not the same thing as being treated, and to add further to that, treating symptoms is not the same thing as treating the disease. JUAN GONZALEZ: And this pill that many of the soldiers took, were they forced to take this pill? Could they refuse it? And what were you told at the time when the military administered it? ANTHONY HARDIE: That the pill was the pyridostigmine bromide pill, also known as the nerve agent protective pill, and it was to help us survive a nerve agent attack, helping to make sure that the atropine injectors that we had would be more successful in saving our lives if we were exposed to nerve agents. I understand that throughout the Gulf War theater of operations, that it varied on how Gulf War veterans—excuse me – Gulf War troops were taking the pills. In my group, I think we were more of the typical type, in that we were mandated to take the pills. In fact, as a supervisor, I was required to physically watch my soldiers put the pill into their mouth, swallow it and make sure that they had taken it, again because there were—these measures were taken because there were significant side effects for so many of us. Again in my group, about two-thirds of us had pretty significant side effects at the time of taking the pill. AMY GOODMAN: Anthony, did people resist? ANTHONY HARDIE: Some were concerned about it, but it was—again, it was mandated, and it’s the military, and we do what we were told. AMY GOODMAN: Were they approved by the FDA? JUAN GONZALEZ: And the immediate effects that you had at the time? ANTHONY HARDIE: Like we were told we would have the symptoms of low-level nerve agent exposure, so watery eyes, respiratory issues, runny nose, diarrhea, upset stomach, tremors, fatigue, all those sorts of things, and feeling very—just simply feeling very ill.
AMY GOODMAN: Can you tell us what the Kuwaiti cough is, Anthony Hardie? ANTHONY HARDIE: Sure, that’s a nickname that some of us Gulf War veterans gave our cough that we developed while over in the Gulf and then came back with. I coughed up black sputum for the last two months that I was there. I was excited when the war was over. I could start running again, began running and breathing in that black oil well fire smoke that colored my sputum black, by coughing up significant chunks of—large chunks about the size of a large gumball from my lungs. I believe now that those are probably pieces of lung tissue from exposure to chemical warfare agents and then colored black from the oil well fire smoke as well. But many of us came back, and we had this cough continued thereafter. And while running, then we would use our asthma inhalers—determined later that we didn’t have—we did not have asthma, but joked that that was our—you know, sort of our medal, as well, for the Kuwait battle. AMY GOODMAN: Anthony, we just have twenty seconds, and I wanted to know, with the report out, what do you want to see happen right now? ANTHONY HARDIE: We need to see, most of all, treatment, effective treatment for Gulf War veterans. It’s been seventeen years, and that’s an awful long time to wait for effective treatment. For those who are not getting compensation, of course they need to be compensated. But most importantly, treating those who are ill.
ANTHONY HARDIE: Thank you very much. AMY GOODMAN: —member of the Research Advisory Committee on Gulf War Veterans’ Illnesses, just came out with its report, and national secretary and legislative chair of Veterans of Modern Warfare.